It was Jan. 1, 2011, the start of a new year. A stray dog from Paris, KY, was being transported with other dogs to Tall Tails Beagle Rescue in Freeport, ME, to get a new start in life at a place less crowded than the shelter she was coming from. Somewhere between Pennsylvania and Connecticut, that dog gave birth to six puppies. One was a little pup that came to be known as Baxter. Read the story in Jan’s own words. Six weeks later, on February 18, 2011, the Wojna Family of Stratford, CT, suffered a terrible loss. Their rescued Beagle, Buddy, became ill and was rushed to an emergency clinic. “After the surgeon … consulted with Buddy’s veterinarian, we went ahead with exploratory surgery to see if there was something that could be done to return Buddy to a condition where he would once again enjoy the life to which he was accustomed,” says Jan Wojna. The findings were devastating. Nothing could be done. “The very difficult and painful decision to let our Buddy remain in eternal sleep was made,” Jan says. After Buddy’s ashes were brought home, Jan knew that, though their beloved dog could never be replaced, they needed to adopt another dog like Buddy, one who needed a home, a rescued dog. They logged onto Petfinder. 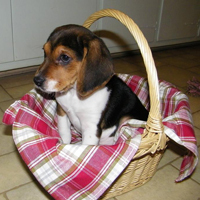 “Through tears, I found a picture of a baby Beagle boy at Tall Tails Beagle Rescue,” Jan says. It was Baxter, one of the pups who had been born on the trip from Kentucky. The family went to meet him and then arranged to adopt him. The rescue group gave Jan the photo that had been posted on Petfinder. The image was date stamped: February 18, 2011. Jan stared at the date and was taken aback. That was “the day our Buddy went to the Rainbow Bridge,” she says. Coincidence? Perhaps. But the family likes to believe that Buddy was watching over them.